big Ikea fruit bowl. Poor things - the had been covered over by the bananas, pears and cara cara oranges. Well, they were two wrinkled to eat and they would not have made enough sauce to feed a baby if I had one. The only thing to do was to turn them into this delectable bread. There is something so old fashioned and comforting about this loaf cake. It reminds me of my step grandmother's apple cake - it was baked in a 9x13" pan and iced with a boiled cider icing. 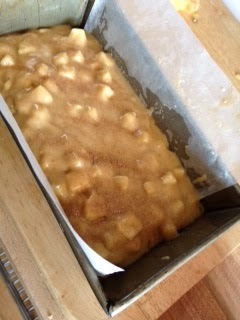 The loaf version is a little lighter on oil and sugar - the cinnamon sugar stands in for the icing. Pan Prep: Grease or spray an 8 ½”x 4” loaf pan and line the long side with parchment paper. The paper should extend over the edge of the pan by 1”. 1. Sift the flour, baking powder, baking soda, salt, cinnamon and nutmeg into a bowl. 2. In a separate bowl, whisk the sugar, oil, melted butter, vanilla and eggs until smooth and light in color – about 2 minutes. 3. Add the wet ingredients to the dry ingredients. Mix only until they are combined. 4. 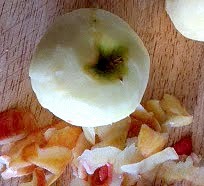 Add apples and optional nuts. 7. Bake for one hour – check the center with a skewer or cake tester. 8. If the cake tester does not come out clean – then bake for an additional 7 minutes and check again. This loaf freezes beautifully - up to one month.